Hamsini Shivakumar is a co-founder of Leapfrog StrategyConsulting, a firm that focuses on informed imagination for breakthrough solutions. She has more than 25 years experience in premier marketing and advertising companies like Procter and Gamble and JWT. In this blog post, I wish to put forward three ideas for intending innovators in India, to consider. a) A supply gap is not a demand gap. b) Innovation without strong branding is incomplete. c) Even a radical innovation, which by definition is highly differentiated, needs to be well positioned and well branded to generate demand and grow consumption. In my experience, many professionals and entrepreneurs in India are good at spotting ‘gaps’ in the market. However, the problem is that these are often supply gaps, spotted due to the entrepreneur extrapolating from his/her personal passions or capabilities. As India is an under-supplied country in many areas still, it seems perfectly reasonable to believe that supply will generate demand automatically. Or that it is a matter of concept ‘selling’, viz, pushing hard(er). A couple of examples will illustrate this point. E.g., I am interested in coffee being from a coffee growing area or agriculturist family, I travel abroad and see some specific types of coffees or coffee making products and I think to myself, these are not available in India, why not be the ‘first mover’ / ‘innovator’ to bring these in? E.g., I travel in the interior villages of UP, see how people struggle with power cuts and shortages and think, why not provide them with solar lamps – as far as I can see, solar lamps are not easily available here. E.g., I see full families travelling on two wheelers and think there must be a market for a Rs. One lakh car, if only someone were to make it. E.g., I see that there is no forum or portal for marketing knowledge to be shared and discussed, so I propose to launch India’s first and only marketing portal. All of these ‘well-spotted’ supply gaps talk to the entrepreneur and innovator’s need to blaze new trails, be a pioneer, do something innovative which has not been done before and hence is exciting, with the seeming potential to grow into a big business over time. The million dollar, unanswered question at this stage is, will there be demand for this innovation? And assuming that the innovator team could identify a set of potential target consumers for the innovation, would those consumers be able to give a reliable answer to the question of whether they would want this innovation or not – when they can’t see it, smell it, taste it or know it in a concrete way; hence clearly appreciate the value that it can bring to their life, vis-à-vis existing alternatives. Concept testing may be valid for known categories and established markets, but does it really work for the radical, the new, the somewhat unknown? With these thoughts in mind, the innovator often has to make a bet and get down to the hard work of translating the idea or concept into a product or service which can be launched into the market. And that is what he/she does, with full enthusiasm, often cheered on by an excited media audience. However, the potential consumer for these innovations, sitting at the other end, is oblivious to all this new supply that could enter his/her life and is going about his-her life in their usual way. Which means that the innovator has to think harder about who is exactly the intended consumer and why would he-she want it compared to his-her existing alternatives. The innovator must be prepared to be surprised because, experience shows that demand for the innovation can come from unexpected places and the market for the innovation could be built in unanticipated ways. And sometimes, in fact, very often, as the track record shows, the innovation that has been created with so much passion, effort and commitment meets with a cold reception and the consumer demand-market potential turns out to be far less than was imagined it could be. One of the key reasons that the supply gap sought to be filled by the innovation does not translate into high demand is that the innovator believes that his creation is new and different enough to sell itself. Or rather, if ‘sold’ through distribution channels, the demand is bound to grow. However, a critical step between the innovation converting to demand is not marketing and sales, but positioning and branding. Even a unique product or service, has to attract potential customers through perception enhancement viz branding. It not only needs an attractive name and identity, it also needs to be well-positioned with an attractive image, to draw its target consumer. It has to reflect the aspirations of its consumer and align to the cultural current of the place and time. It needs a communication campaign and a conversion strategy that will translate interest into purchase. Two types of errors lead to misguided positioning of the innovation. The first is the innovators passion and conviction that he ‘knows’ the customer and what the customer needs, better than the customers themselves. Linked to this, is the unwillingness to be classified and compared, looking through the eyes of the potential customer. The pioneer is resistant to accepting that in the buyer’s eyes, his innovation may not be so radical or unique after all. Or if its uniqueness is perceived and accepted, the buyer is unsure about what to do about it, given that it is so new and unfamiliar. One of the common views of branding as image is that it is akin to stylists who dress the stars and give them the most attractive ‘look’ for the context of their appearance. However, in reality, positioning a brand is all about classification and framing. It is about understanding the mental classification and categorization that the prospective buyer makes and the conclusions and emotional meaning that he assigns to the innovation based upon that categorization. If this is not properly understood by the innovator and his campaign team, not enough time, attention and effort is given to this stage. The launch team follows the direction of the innovator in defining the positioning, sometimes this can be right and sometimes it can be spectacularly wrong. These errors of judgment by innovator teams, of mis-positioning their innovation, are not just what individual entrepreneurs can make, they can be made by large corporations too. 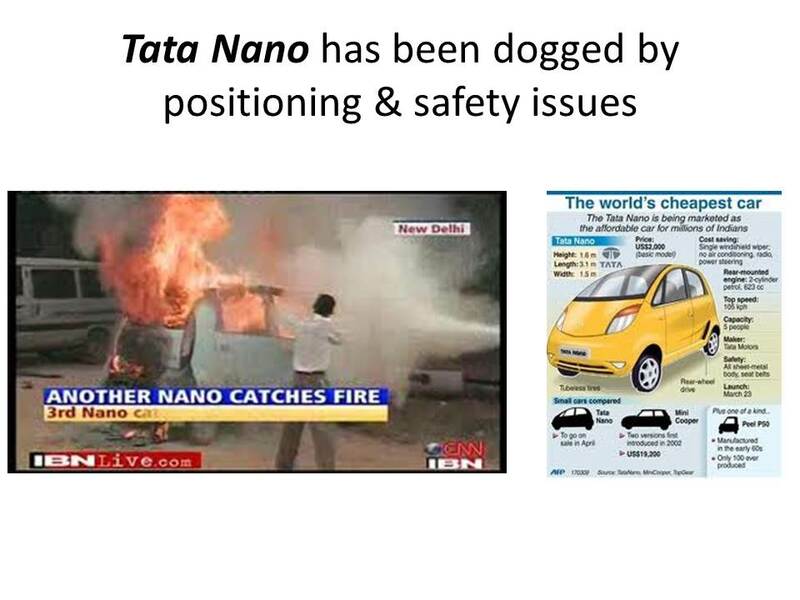 The Tata Nano is a spectacular case study that illustrates the above. The Nano is a radical innovation in cars, the first of its kind in the world and so on. However, the consumer who it was intended for, the first time car buyer in India, rapid upgrader from two-wheelers, was left under-whelmed by the launch positioning of the brand. It had to be re-positioned with a young and trendy image; sales are still less than anticipated. This happened despite two years of media coverage from all around the world. 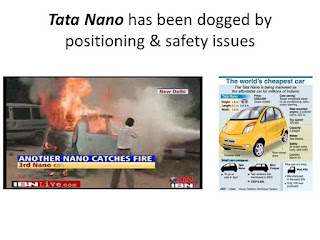 In the case of the Nano, mis-positioning issues were compounded by product safety issues as well. Godrej Chotu-kool, a small, battery-operated refrigerator intended for small town and rural markets is another case in point. Give importance to completing the offering to the consumer, through adequate focus on positioning and branding. To get this right, setting aside innovator ego and having adequate humility to respect the consumer and potential buyer’s perception and value frames is a must.